The white-backed duck (Thalassornis leuconotus) is a waterbird of the family Anatidae. 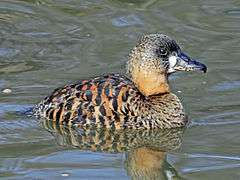 It is distinct from all other ducks, but most closely related to the whistling ducks in the subfamily Dendrocygninae, though also showing some similarities to the stiff-tailed ducks in the subfamily Oxyurinae. It is the only member of the genus Thalassornis. These birds are well adapted for diving. On occasions they have been observed to stay under water for up to half a minute. They search especially for the bulbs of waterlilies. From danger, they also escape preferentially by diving; hence, the namesake white back is hardly visible in life. White-backed ducks live in southern Africa, especially between Senegal and Chad in the west and Ethiopia and South Africa in the east. Their habitat consists of lakes, ponds, swamps and marshes where they are well camouflaged against predators. There are two subspecies, Thalassornis leuconotus leuconotus and Thalassornis leuconotus insularis. The latter lives entirely on Madagascar and is considered to be endangered by hunting, habitat loss and the introduction of competing exotic species. The white-backed duck is one of the species to which the Agreement on the Conservation of African-Eurasian Migratory Waterbirds (AEWA) applies. ↑ BirdLife International (2012). "Thalassornis leuconotus". IUCN Red List of Threatened Species. Version 2013.2. International Union for Conservation of Nature. Retrieved 26 November 2013. Kear, J. 2005. Ducks, Geese and Swans. 2 vol. Oxford, UK: Oxford Univ. Press. Woolaver. L., and R. Nichols. 2006. Nesting survey of the white-backed duck at Lake Antsamaka in western Madagascar. TWSG News 15:34–37. Young, H. G., R. Safford, F. Hawkins, R. Rabarisoa, & F. Razafindrajao, 2006. Madagascar whitebacked duck: What is its true status? TWSG News 15:38–40. Delany, S., & D. A. Scott. 2006. Waterfowl Population Estimates. 4th ed. Netherlands: Wetlands International. Johnsgard, P. 2010 "The World’s Waterfowl in the 21st Century: A 2010 Supplement to Ducks, Geese, and Swans of the World"